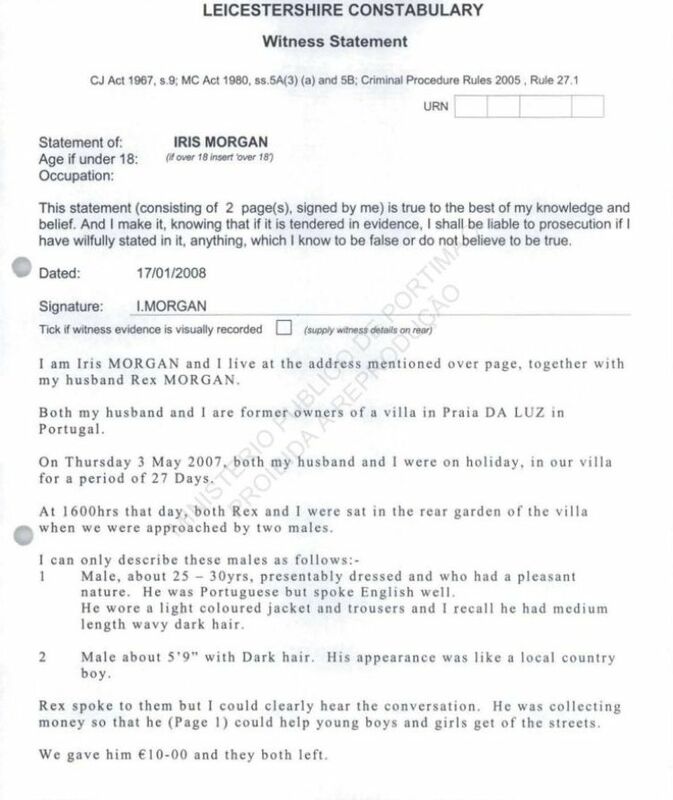 Statements were obtained from Iris and her husband, Rex Morgan regarding an approach that they received at their villa in Praia da Luz on 03-05-2007 from two men collecting for a local hostel for youngsters. The details of the hostel that Iris recollected to the best of her knowledge was that it was situated at a place called something similar to Baro St Hoa which is beyond the town or village of Espiche. At 1600hrs on Thursday, 3rd May, 2007, both myself and (my wife) were sat in the rear garden of the villa. I saw a male's face appear around the corner of the building. This was the corner of the building that led to the driveway. This person, along with another male then walked towards us. 1( 25 ? 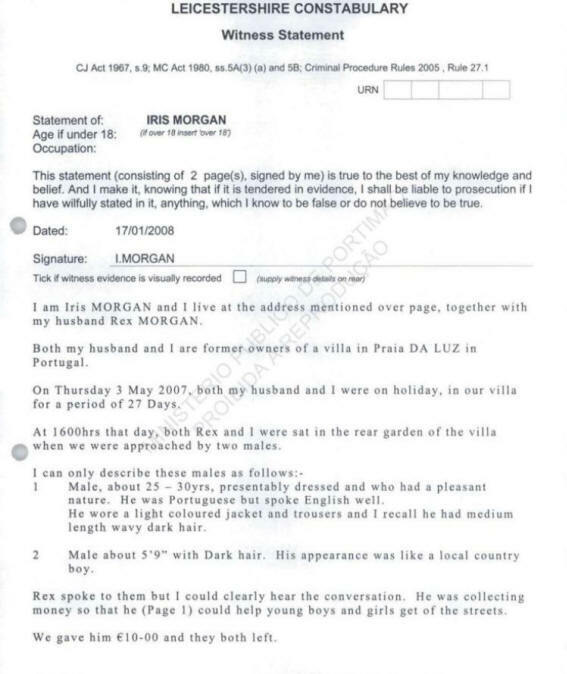 30 year old male. About 5?10 in height and slightly tanned. 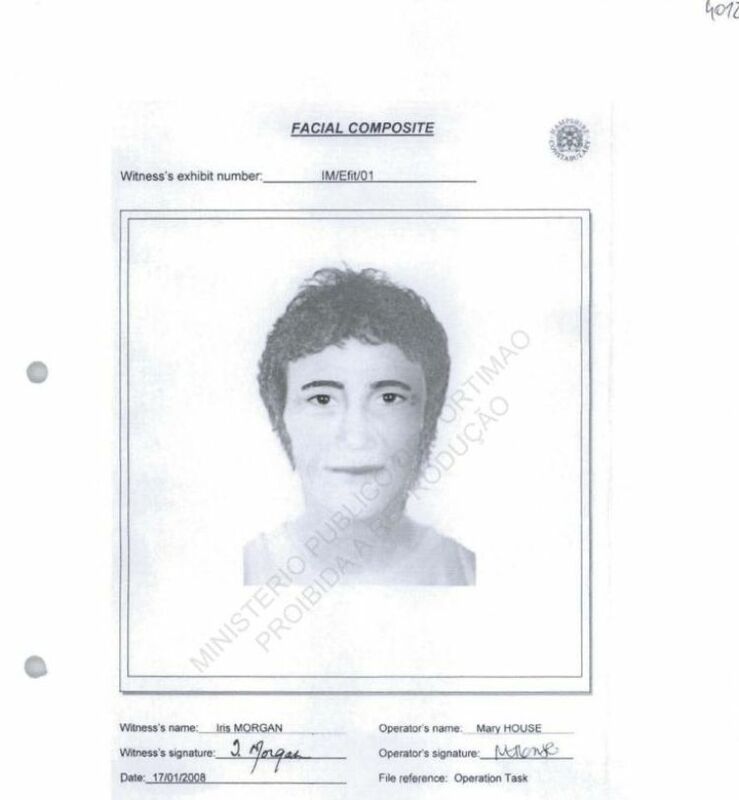 In my opinion he looked Portuguese. I do not recall what clothing he wore but I do recall him being tidy in appearance and spoke good English but with a Portuguese accent. 2) 18 ? 20 years. Slightly shorter than the first male. He was also reasonably dressed. The first person walked towards me and introduced himself. I do not recall his name however he did show me an identification card on which was a picture of him. I did notice that the picture showed with a moustache, but that he did not have one. He did in fact point this out to me as well. He then went on to explain his purpose for being there. 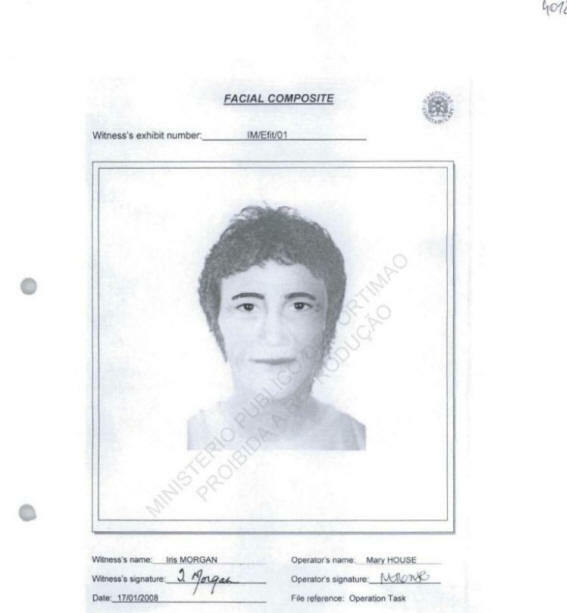 He said that he was collecting money so that he could help to get young boys of the street and keep young girls away from prostitution. He showed me a (Page 2) portfolio with pictures of a hospice where these young people are housed. I do not recall where this hospice is located. He asked for a contribution and I gave him 10 Euros. He did provide me with a receipt. I did not take much notice of their appearance as I did not feel threatened by them. I thought them to be genuine. 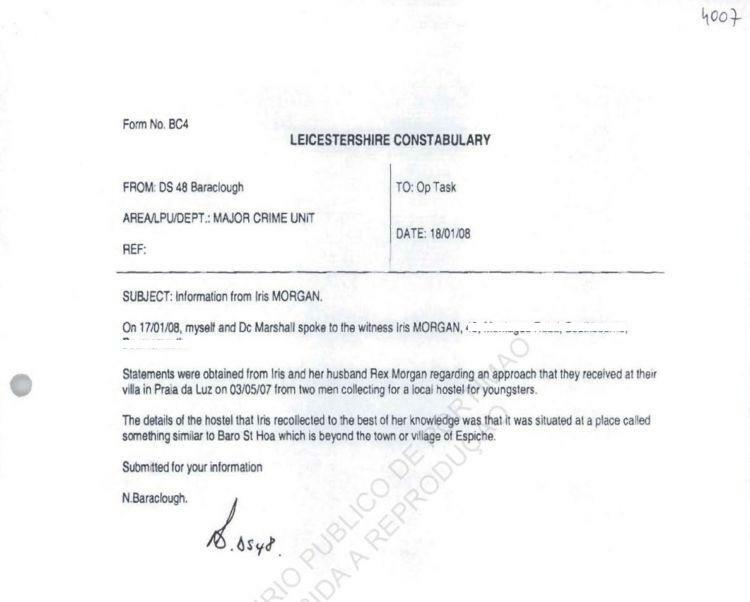 I only became concerned when i heard that little Madeleine McCann had gone missing later that day. 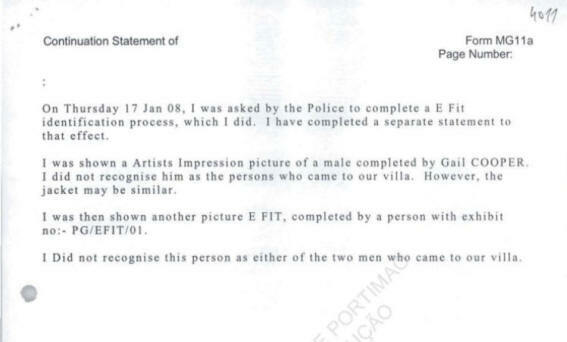 Prior to recording this statement, I was asked by the police to complete a ?E FIT? identification procedure. 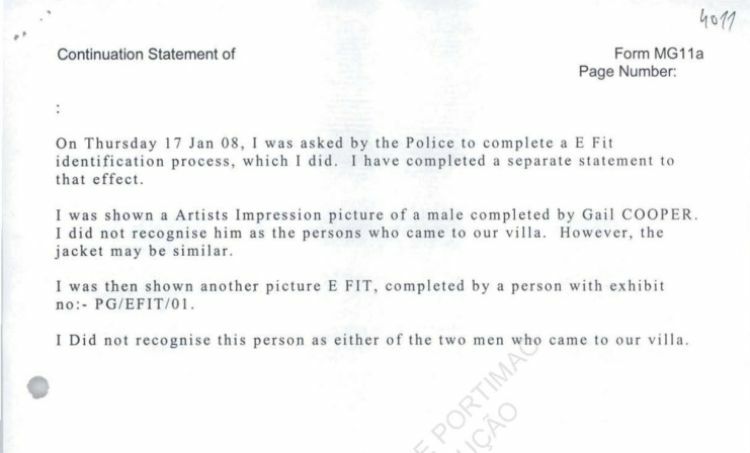 I do not recall that I could satisfactorily recall both of the persons features to complete an E FIT so I declined to do so. I was the shown by DC 1756 Marshall, an artist's impression of a male completed by Gail Cooper. I can say that he is similar, but the man I saw was a bit smarter. This guy looks a bit like a hippy. He certainly did not look like that. His features are similar, his hair is not like that. 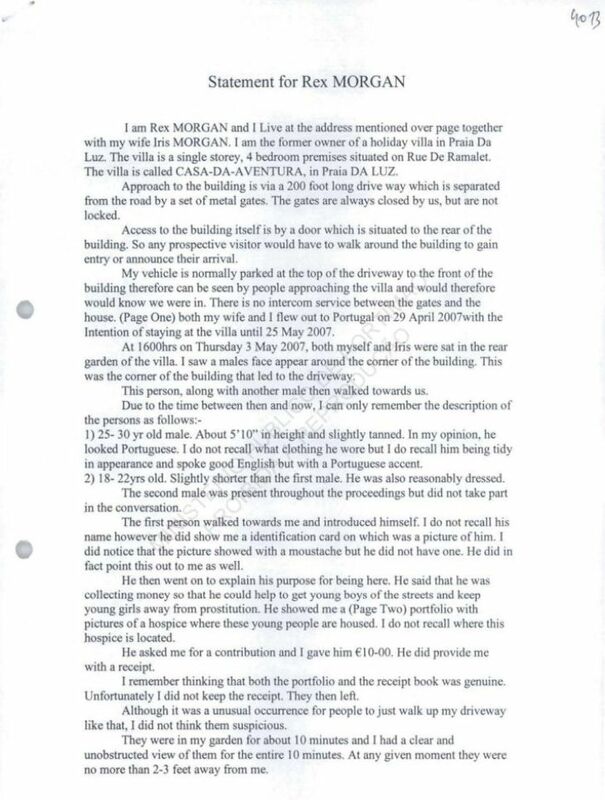 It was (page 3) shorter and smarter. He did not have a moustache. I was the shown a second picture. I do not recognise him by this picture. His hair might have been a bit the same but I do not think that looks like him. I do not remember his face at all so I do not recognise him by this picture. 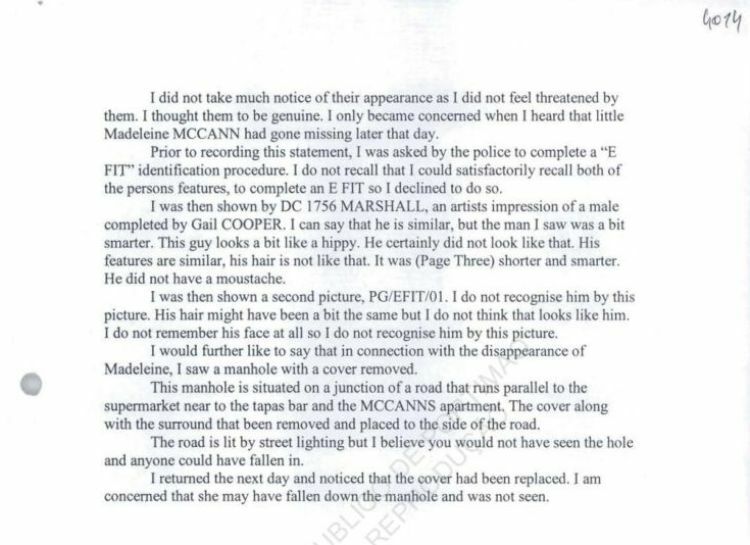 I would further like to say that in connection with the disappearance of Madeleine, I saw a manhole with a cover removed. This manhole is situated on a junction of a road that runs parallel to the supermarket near to the Tapas Bar and the McCanns apartment. The cover along with the surround that been removed and placed to the side of the road. The road is lit by street lighting but I believe you would not have seen the hole and anyone could have fallen in. I returned the next day and noticed that the cover had been replaced. I am concerned that she may have fallen down the manhole and was not seen.